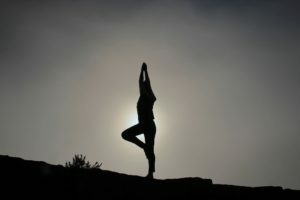 Yoga – I’ll just put it out there, I was not too savvy about what yoga was before writing this piece. My only experience with yoga was a few classes I took a long time ago – I don’t remember much and I didn’t stay around to find out more. Yoga seems to be the trendy, popular thing to do these days. Everyone is doing it. Yoga studios are popping up like mushrooms. Yoga is being taught, in schools, in hospitals, in the workplace, and in YMCAs. Yes. yoga is trendy and it’s everywhere. Yoga mats and Lululemon type clothes are in all the sports stores. It is very popular, particularly among women, though men do it as well. So, I wanted to explore it and find out more, especially what all the terminology means and where it comes from. I set out to learn more about this topic – the origins, the philosophy, and the practice. I hope you will enjoy this journey of discovery. Brahman is a Hindu word used to describe what the Hindus call their god. Basically, the belief is that Brahman is everything and everyone, and flows through everything. It is a universal conscience – a kind of fluid reality. Traditionally, all four aspects must be an integral part of the ritual; each has a specific purpose. The movements and postures: These asanas are very specific (each with its own name) and involve specific transitions from one position to another in order to attain a posture representing this name. The names of the postures can be names or movements of animals, constellations, the moon, the sun or anything else. In Hinduism, there are over 330 million deities (little gods). If you were to take a trip to India, it would not be surprising to see people doing yoga in the streets. There are so many statues of “little gods” and the people assume these postures in front of the “deity” as an offering. Cows and monkeys roam freely since they are some of the deities in Hinduism. The Breathing: In yoga sessions, participants are instructed to breathe consciously, which is the essence of yoga. The conscious breathing assists you in connecting with the subtle energy within. Through the practice of proper breathing, yoga adepts learn to eventually navigate the different levels of consciousness. Essentially you are letting go of the past and the future and focusing on the moment inside a breath. Prana and Pranayama: Prana refers to the vital force – the energy that animates the lungs. Pranayama is the mode of breathing involving three phases: inhalation, retention, and exhaling. According to yoga practitioners, breath is also vibration and has a specific sound which, when emitted enables the flow of energy. One of these we are all familiar with – Om. The Energy: like in the Martial Arts such as Tai-Chi or Karate, there is a free flow of energy. In the Martial arts, this energy is called Qi. In yoga, it is called Kundalini (potential energy). It flows through channels called Chakras (points of energy in the body). In acupuncture, these are referred to as pressure points or points of stimulation. There are main Chakras through which the Kundalini “serpent” travels from the base of the spine up to the pituitary gland (the 6th chakra) in the frontal lobe in a weaving fashion, opening up each chakra as it moves up. The 7th chakra is the crown (the top of the head), which is the ultimate destination for full awakening. 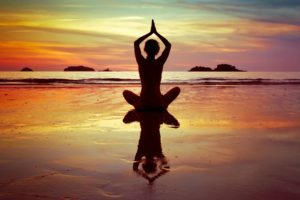 The Goal of Yoga: The goal of yoga ( according to yogi swamis) is to move toward an expanded state of consciousness or what yogis call: a Kundalini Awakening. 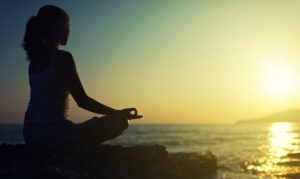 The Yoga Sutras (the writings) explain that by moving the energy up through the chakras along the spine (through breathing and meditation chants) and into the pituitary gland, the practitioner can acquire special abilities such as divination, levitation, mind-reading, Astro-projection, and not feel hunger, thirst or the need to breathe. As the yogis and the Yoga Sutras say, we can not separate the basic belief of Hinduism from yoga, which is reincarnation. This belief is that there is an eternal cycle 0f birth-death-birth when a soul moves from body to body. This process is based on the law of karma. According to a former yoga instructor, Laurette Wills, (yoga instructor for 22 years), this means that yoga is essentially a preparing of the body for death in anticipation of the next reincarnation. Meditation: According to swami.com, we can not separate or isolate the physical postures and movements from the rest of yoga. Yoga is meditation, they point out. It is a process. Yoga, involves the senses, the body, the breath, and the various levels of the mind in order to achieve a higher consciousness. For this reason, meditation will necessarily involve, in addition to postures and movements, visualization, contemplation, following an object of focus, and mantras (speaking, hearing, feeling). The goal as, one former yoga instructor stated is ” to attain oneness with the universe – enlightenment through the emptying of the mind”. In yoga, this relaxation phase is called Savasana. It is a crucial phase which brings the body back into alignment – a state of equilibrium and allows the brain to unwind. So, What’s the Fuss over Stretching Exercises? Yoga is very popular in all age groups. Yoga adepts say it is fun, relaxing, energizing and great for developing muscular strength and balance. They say that it is a really great way to exercise. They say that after a yoga session they feel good all over and relaxed. The Swami and traditional yoga practitioners’ (yogis) perspectives are very different, They state that it is impossible to separate the physical aspects (the stretching, postures, and movements) from the rest of the yoga discipline; they are necessarily intertwined. In fact, these traditional practitioners say that Westerners do not fully comprehend the complex metaphysical and spiritual nature of yoga. Yoga must be yoga; the mind, the body and the spiritual united with the Divine. 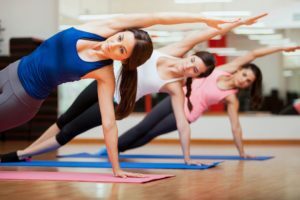 Are there Dangers Associated with Yoga? There actually are some concerns regarding the practice of yoga, Injuries do happen. In a study conducted at Sydney University, researchers found that the incidence of pain is more than 10% (which is comparable to most sports). It can also make existing pain worse. In the interest of giving as much accurate information as possible, it is necessary to say that there is another side to what is promoted. There can be serious consequences (both physical and mental) related to certain yoga practices. Here is a link to a comprehensive site which contains many references to the side effects of yoga. There are too many to summarize, so I invite you to consult it if you so desire. We all want to be in better shape physically and mentally. We all want to have less stress and more peace in our lives. Yoga seems to have been chosen as a means to achieve these goals as and has millions of adepts around the world. To this end, I wanted to see what yoga was all about and provide information as accurately as possible. 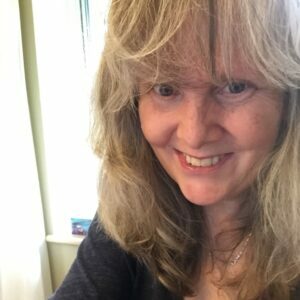 I hope that this post has been helpful to you. Please let me know your thoughts in a comment. Please click Share if you feel this post can be helpful to someone else.